Émile Zola, portrait by Edouard Manet. 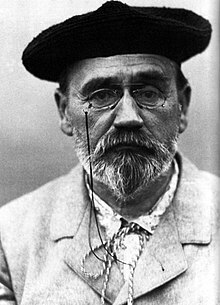 Émile Zola (IPA: [emil zɔˈla]) (2 April 1840 – 29 September 1902) was a major French writer and the most important naturalist writer. He worked toward political liberalization of France. Zola was nominated for the first and second Nobel Prize in Literature in 1901 and 1902. His death from carbon monoxide poisoning is suspected to have been murder. ↑ "Nomination Database - Literature - 1901". Nobelprize.org. Retrieved 2014-02-07. ↑ "Nomination Database - Literature - 1902". Nobelprize.org. Retrieved 2014-02-07. This page was last changed on 10 February 2018, at 16:12.